Sorry, fell off my chair laughing just then. Anyhoo, Outcast Studios continues to keep me supplied with reasons to keep my pencils moving. I found this thing where members can post a request for a free commission, as long as they agree to draw a free commission for the next person who posts. I've never done a commission before so I figured this would be a good way to get started. At least the person's getting what they paid for, right? 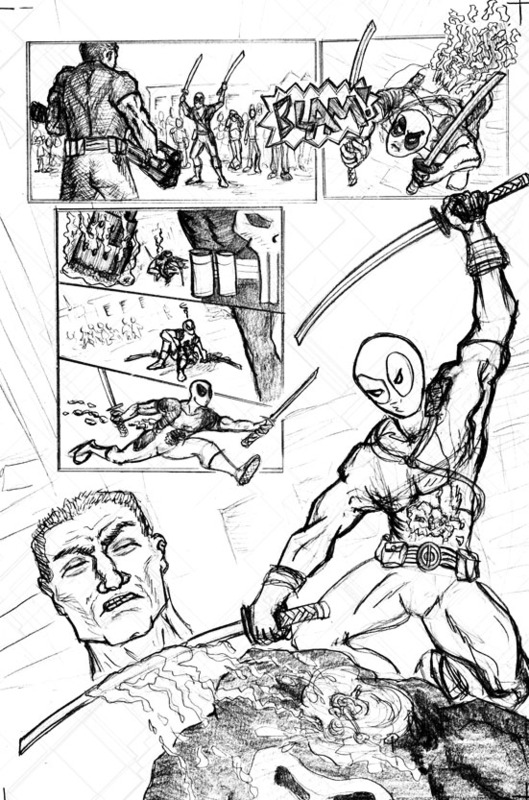 Then I got tagged to do a fight between Deadpool and Punisher. I kinda know Deadpool, but I had to Google Punisher. And having done so, my initial reaction was, "wow. gun show." My secondary reaction was "this is way out of my range, what with me not being able to draw guns or fights." Technically, I could have vetoed and asked for a different subject, since the artist does have "I can't draw that" veto power. But no, I decided to challenge myself and actually draw something that's kinda too hard for me, and maybe make a portfolio piece from it. I gave it some thought and talked to some friends, and tried to figure out what a fight between these guys would look like. Punisher, he's a guns and explosives guy all the way. 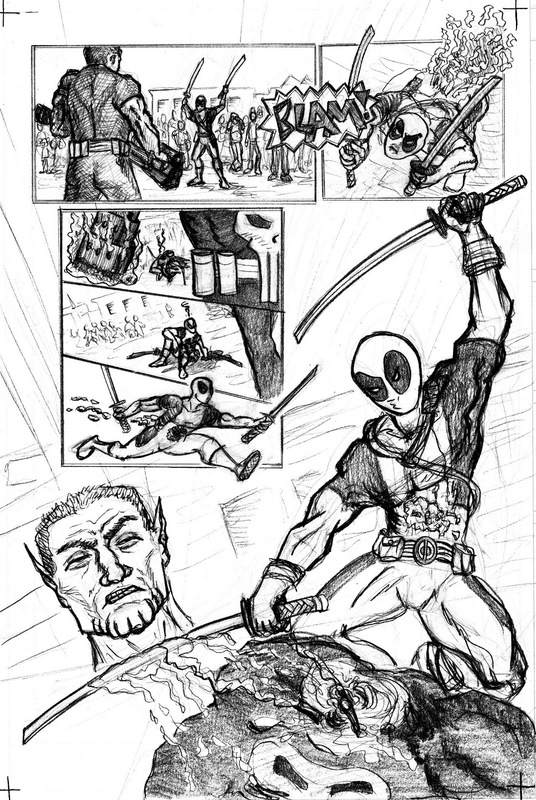 Deadpool does guns, but he does swords too. But who brings a sword to a gunfight? Who brings a sword to a gunfight? That guy. Play it like this scene. Only different. Because if you shoot Deadpool and walk away, it's not going to turn out so well for you. Never get in a death match with a dude who doesn't die, right? Having decided that, it all came down to how to tell the story. 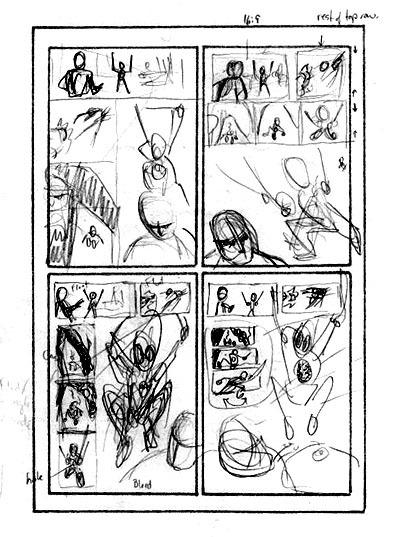 I knew the basic beats I was going to cover, and started doing some thumbnails to figure out the page flow, panel breakdowns and stuff like that. I knew I wanted to start with the standoff, have a walk-away with Deadpool getting up in the background framed by the Punisher's arm/smoking gun silhouette, and end with the ninja leap. Thumbnail 1 was based on the idea that the standoff is basically a 16:9 aspect ratio movie shot, and the leap would be basically a vertical panel. But having sketched it out, it seemed a bit clunky, and I felt like there needed to be a little more time between exit wound and ninja leap. Thumbnail 2 got the story beats and timing working OK for me, but I couldn't really feel the panel-to-panel handoffs. Thumbnail 3 was back to the horizontal vs vertical thing but it really didn't flow. Also, the middle action took up way too much space on the page. Thumbnail 4 was just right. I talked to some friends, showed them the thumbnails, and asked... "Last panel... Head on, or head off?" The votes were pretty much unanimous for "head off." Not sure what that says about the people I hang out with, but it did give me yet another new challenge. My natural style tends to be cartoony, and further to the fluffy bunnies side of the spectrum than the blood and guts side. And the general consensus on this left it very much to the blood and guts side of the drawing spectrum. 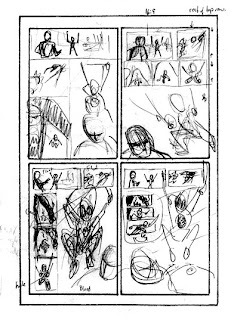 Having settled on the basic page structure, and the ending, I did a rough layout drawing to a bigger scale so I could see a little better what I was doing. 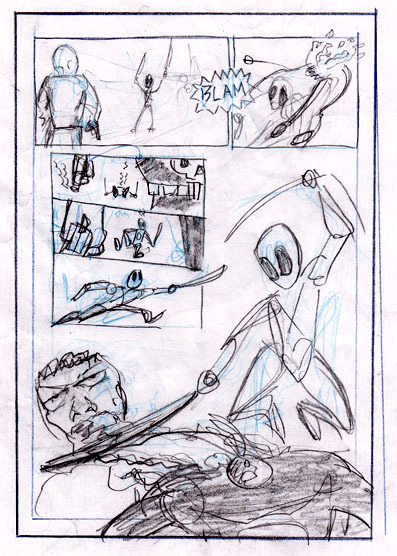 I also fixed the narrative glitch that I found in the thumbnail panels 3-5, where Punisher had basically already exited stage left before Deadpool caught up with him. Then my day job ate my life. The good thing about the Outcasts is that they're all pretty gracious about the whole "I have to do my paid work and school work before I can do the free stuff." Even so, I feel pretty bad about how long this one took to finish. Oh well. In delivery times as well as in quality of the finished work, you get what you pay for. For panel 1 of the final product, I basically lightboxed the film still from Raiders, so I could make sure everyone was standing on the same ground. Then I replaced the sword guy's pose with my own gesture from the original thumbnail, and I gave Punisher muscles a little more in keeping with his character, and a gun that would make the kind of spectacular exit wound I was going to draw in panel two. Panels 3-5 went as planned, then I had the big challenge. I Googled some surgery sites to find out what a cross-section of a neck looks like, and dropped that in there, so that the arterial spray was coming from the right part of the severed neck. Even though it's not super clear from my rendering. The body is supposed to be falling forward and the head flying backward/to the side with the followthrough of ths swing, but again, my ability to render (or lack thereof) has left it a bit flat and ambiguous. And finally, because I couldn't let it end that way for poor old Frank, I came up with an alternate ending that makes the decapitation OK. So, there we are then. Not bad for a first go, overall, and now I guess that's me, open for requests. If you don't mind a bit of a wait.